The largest and most impressive gaming complex in Pennsylvania. Conveniently located 20 minutes north of center city Philadelphia, I-95 exit 37 or PA Turnpike exit 351(westbound), exit 352 (eastbound) onto Street Road in Bensalem, Parx features 164,000 square feet of gaming; 3,500 slot machines; 120 live table games; 50 poker tables; live racing & simulcast action; Parx Grill, an upscale signature steakhouse; Foodies food court; Chickie's & Pete's; 360 bar and nightclub; Jax sports bar, Finish Line bar, Sang Kee Noodle Bar and complimentary parking for over 5,000 cars. The largest and most impressive gaming complex in Pennsylvania. 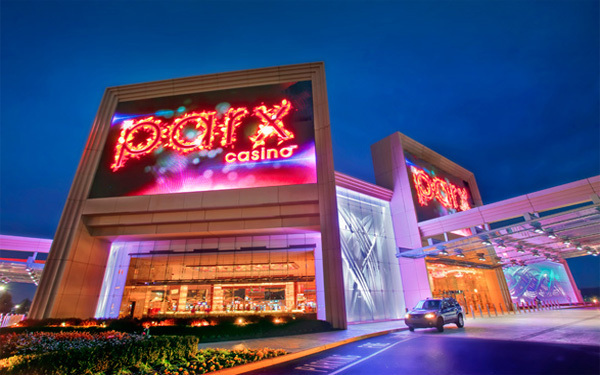 Conveniently located 20 minutes north of center city Philadelphia, I-95 exit 37 or PA Turnpike exit 351(westbound), exit 352 (eastbound) onto Street Road in Bensalem, Parx features 164,000 square feet of gaming; 3,500 slot machines; 120 live table games; 50 poker tables; live racing simulcast action; Parx Grill, an upscale signature steakhouse; Foodies food court; Chickie's Pete's; 360 bar and nightclub; Jax sports bar, Finish Line bar, Sang Kee Noodle Bar and complimentary parking for over 5,000 cars.